Meet the Vivids, a ten shade selection of Maybelline Color Sensational Lipstick in array of bright, popping shades of reds, corals, and plums with a richly pigmented formula. Maybelline Color Sensational Vivids Lipstick aren’t for the weaklings. These are loud, outrageous shades of color. Which by the way I can’t wear….ha…I don’t fare well with cream lipstick and most of these do indeed have a cream, mod finish. On the upside…as promised…they offer a saturated color experience that yields full color coverage in a single swipe. Pigmentation is excellent here and colors are true to tube giving lips a blast of bold color payoff that’s sure to please those who like a daring lipstick. I personally love and hate the Color Sensational Lipstick Collection as you may already know from some of my past reviews. I think Maybelline definitely improved on the overall texture with the Vivids Collection so if for any reason you felt the formula a little to dry before or perhaps it sat unnaturally on your lips (that’s how I felt) you might be pleased with the minor improvements they made. It’s still not moisturizing enough for me but it does have a smooth, easy glide on lips and seems to settle and sit on lips in a more comfortable, weightless way versus the old formula. You really want to be careful with these as they do accentuate every little line, flake, or dry area on your lips. Blame it on the bright, neon shades or perhaps it’s just that type of formula…but please prep well prior to application as they do emphasize problem areas. I wouldn’t recommend them for aging lips for this reason. I also recommend a lip liner of some sort to keep them from migrating and feathering because they do so like to journey around my mouth. The colors are outstanding. Even though I’d never pick these for myself and don’t even look good in them, I can’t deny that they are bright, bold, neon-like, intense, and very pretty in the packaging (just not on my mouth…EEP no likey!). Not everyone will be able to pull off these shades but those who do should get out there and grab a few shades. It isn’t the greatest formulated lipstick on the drugstore market but the colors may sway you towards a purchase. And hey, if they are on sale I’d say grab one or two! They are available now at drugstores. aw thanks ivy! I like the red well enough but the coral I’m unsure of! It’s ray how different we see ourselves VS how others see us! And even how different others opinions differ from each other! The coral shade is my fave on you, put of those three shades! I think u totally rock it! I’m gonna try these out! Maybe a violet! I don’t own a violet lippie, but kind of want one! aw thanks simone 😀 <3!!!!!!!!!!!!!!!!!! violet was tempting when I saw it at CVS but I didn't go there hehe! Def can't pull that one off! I’ve never done violet either! I’m thinking ill sheer it out a bit, less and less, each time I wear it. Sort of get myself comfortable in it, instead of going all out vivid and worrying how I look the first day wearing it. 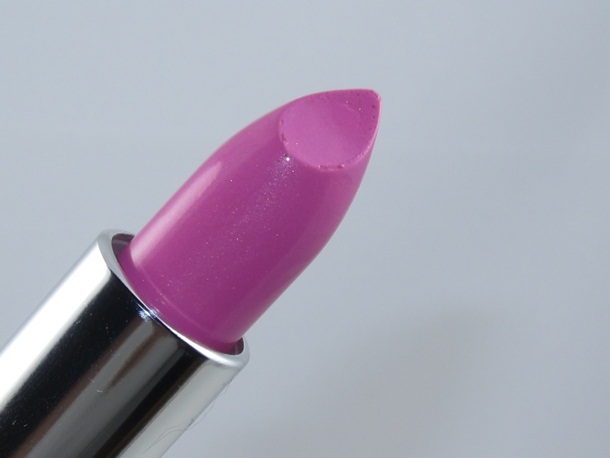 I did that with this Barbie pink (a la nicki minaj), and now it’s one of my fave lippies! me either tam! sucked it up for the review hehehehe ;-D and thanks! I’m scared of them tbh! I love the pink shade! It’s so flashy. Exactly my kind of lipstick !! I actually think the shocking coral looks great on you! Ummm….are you seeing the same thing I’m seeing?! You look amazing in these shades! I really like the coral one on you! Might have to pick that one up! even though you say you cant wear them I think you look ethereal in pink pop, Muse! SO so long dina <3! miss ya around here! I hope baby lucy is well! <3!!!!!!!!!! it does, it’s sorta a vanilla taste/scent! aw thanks leigh!!!!!!!!!!!!!! it was amazing! How was yours?! vi my pleasure! yeah that’s kinda how I feel too, corpse-like ;-D def agreed on the gloss it helps a lot! aw thanks <3 Not sure on the coral do like the red ok! I think the 1st and 3rd ones look great on you. The 2nd one is just a weird color to me. I’ve gotten so used to sheer glosses and balms that I feel so weird if I try to wear a bolder color now. I feel weird in all three Am ;-D they are just really loud! oh Muse! That shocking coral looks gorgeous on your lips!! aw thanks lin I am so scared of it though! Coral looks gorgeous on you! Okay, Muse, I know you don’t like it but you ROCK Shocking Coral. Just saying. the red on looks great on you! aw thanks S! it’s prob my favorite of the bunch! Muse, I think they look lovely on you, especially Shocking Coral! For what it’s worth, that coral shade looks very pretty on you. It’s all personal preference, though. aw thanks alexis! why don’t you return it and get the shade you want chica? I already wore my shade a few times and my husband thought it was really pretty, so I’ll use it on date nights! I don’t think I’ve ever seen so much vibrant shades of lipstick on you. lol right? I’m scared hold me! pink pop looks great on you IMO! Do you know if this is a limited edition or permanent collection? alzn I think they will join the perm collection, the press release from maybelline says nothing about LE. I caved…I got the Rose and the Coral lol. ;-D do you like ’em? Yeah, surprisingly! The colors are really nice and the formula is better than I expected! I also don’t feel TOO clowny in the shades I chose, so that’s good (as long as I wear more neutral makeup otherwise) lol. I got Shocking Coral and Wild Rose. I am considering going back and getting Fuchsia Flash tonight too. I tried your rec and it actually works great! sheered out with a ton of clear gloss def looks better than full on opaque color! Yay!! I’ll have to try it too then (even thoguh I kind of love the bold vivid look too). Yeah, I think I’ll pass on these. I like a bright lip on occasion but these are toooo much for me. I’m still having hit or miss luck with the Color Whispers – I have like four, and I can’t decide if I actually like them or if I’m just collecting them because they’re new! I think I prefer the L’Oreal Caresse lipsticks to the Color Whispers, though. blue I love color whisper but did you notice that color selection is a little weak? Most are pale/mod…I wish they had more intense, brighter shades. Yes! This is my biggest problem with it – I can’t find many colors I want to wear. They’re all so pale they look terrible on me, or they just don’t show up at all! The look so pretty!! Especially that coral. And i think they look great on you,really! aw thanks artemi 😀 I’m really NOT so sure! I love these. I have the coral one and the fuschia one. I want more. On fire red is very pretty. Shocking coral look gorgeous on you! I (of course) picked up one of the bright orange ones but I was a little disappointed. I felt like the color just wasn’t opaque on me. It was looking for something obnoxiously bright and opaque and this just wasn’t it for me. I think I will return it. Glad to read your review! Do you have the UD Super Saturated lip pencil in Punch Drunk? I think you would like it. 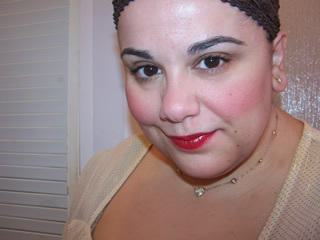 I’m sure you already have NARS Heat Wave, but that’s a little more red if I remember correctly. These colors are just too pretty for me not to take a chance on them. I’ll find a way to make them work! MUSE! You rock these lippies! I’ve also rocked a pigmented lip with NO other makeup and it can work as long as your skin looks good and your eyes aren’t red/puffy from a late night. Bright lips brighten up your entire face and when you’re in a hurry lips and mascara are the fastest way to perfection. hey majick you’re too kinda thanks…yeah def agreed with a more natural, neutral makeup and let the lipsticks shine through! I was testing a few things at once so my makeup is too loud and clashes with these lippies ;-D I love when you’re chatty ;-D your comments are always WAY helpful! that works with a little gloss on top ;-D thanks for the tip! Yeah, then at least you can get some use out of them xD. Gurrrrrrrl, you totally rock these colors. I love them on you. 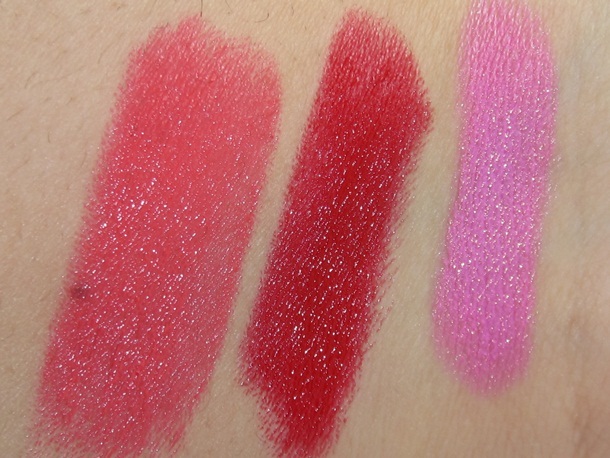 I picked up Pink Pop, Shocking Coral, Fuchsia Flash, and Hot Plum and love all of them! They remind me of MAC’s Amplified lipsticks because of how they apply. Shocking coral looks really pretty on you, your too cute!! aw thanks leila you’re too sweet! OMG, PINK POP IS GORGEOUS!! I just picked up pink pop, shocking coral, and outrageous orange. I love the way the coral looks on you. I hope it looks as good on me.